After the heartbreak of last episode, I’m intrigued to see whether season six of Game of Thrones is able to keep up the momentum of the recent pattern of great episodes. This season has been a pretty strong one so far, with some highly memorable moments and some actual plot progression for our favourite characters. We’re just over halfway now – how are things moving forward? We begin the episode with Meera and Bran in the North beyond the Wall – directly following the traumatic events of last episode, escaping the White Walkers who are after their blood. Bran is still stuck in his vision, seeing flashes of the past and perhaps the future. He sees his family being butchered, and repeated visions of dragons and White Walkers. Most interestingly, in a fun reference to Game of Thrones history, he sees the Mad King Aerys II calling for people to be burned, and Jaime Lannister slaying him. I hope we get to see more of this. 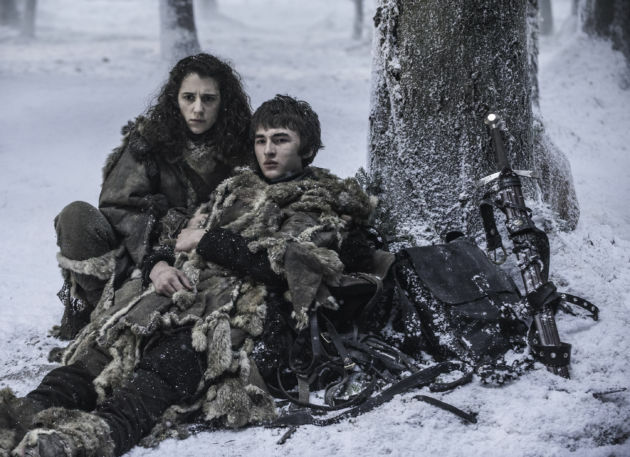 Meera finds it difficult to drag Bran and gives up. Bran awakens and knows that the White Walkers have found them, but a mysterious hooded figure on a horse comes to their aid, taking out their enemies, and taking Bran and Meera away to safety. Gilly and Sam are heading to Sam’s ancestral homeland at Horn Hill. The two of them are really cute. Sam is nervous to see his parents, particularly his father Randyll Tarly, who shipped him off to the Wall to become a sworn brother of the Night’s Watch so that he couldn’t inherit the Tarly title. Sam refers to Gilly and Little Sam as his family, however he didn’t tell his parents that Gilly is a wildling because his father doesn’t approve of them; in fact, his father hates wildlings as a result of fighting them throughout his life and preventing them from invading. They head to Sam’s parent’s place for what will no doubt be an extremely awkward encounter. Sam and Gilly meet with Sam’s mother and sister who seem nice enough. I like watching Gilly and Sam together because it’s a nice relief from the constant drudgery of death and sadness that is Game of Thrones. But this scene felt a bit like something out of a medieval romance film. It’s a strange tonal shift, and somewhat of a disorienting one. I do cross my fingers that this wasn’t a waste of screentime because there are things that the executive producers have left out thus far (cough – LSH) which could have been included instead of this stuff. Meanwhile, in King’s Landing, Tommen and the High Sparrow are chatting in the Great Sept of Baelor. Tommen worries about his wife, Queen Margaery, having to do the walk of atonement/shame like his mother did last season. The High Sparrow is determined that Margaery must atone for her sins through the walk of shame. Tommen goes to see Margaery who looks as if she’s been hypnotised or brainwashed; she seems pretty happy even though she knows she’ll have to parade naked through the streets. Tommen and Margaery agree that there’s something very charming and unique about the High Sparrow. Margaery appears to have become enlightened under the High Sparrow’s guidance. That, or she’s become institutionalised. She reveals she’s developed an awareness of her own sense of sin and the need to be seen doing good. She says it’s good to let go of lies; she feels free. 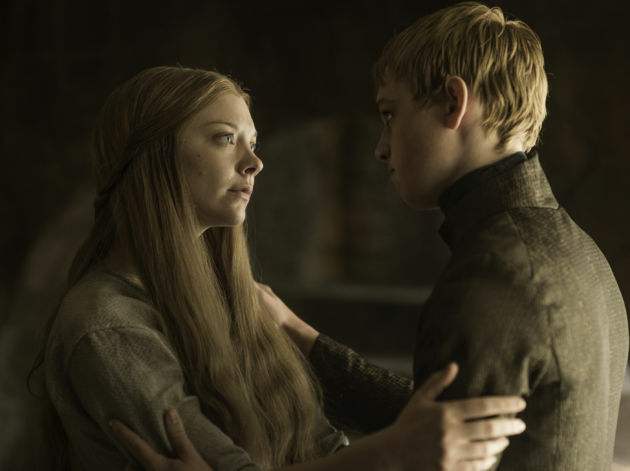 Tommen asks after Loras, but Margaery says he too has to atone for his sins. This is a pretty big change of heart from her last scene on the show, where she was fiercely protective of her brother and their need to maintain strength in the face of theocratic adversity. I am hoping that this is an act. Back at Horn Hill with Sam and the Tarlys, Gilly is dressed like a noblewoman but the finery does not suit her well. She and Sam go to have dinner with his family in an extremely awkward scene where Sam’s father, Randyll Tarly, reveals just how nasty he is. He’s truly awful to Sam, and when Gilly stands up for Sam and accidentally reveals that she’s a wildling, he gets worse. Randyll says that whilst Sam hoped for the Tarlys to care for Gilly and Little Sam whilst he goes to study to become a maester in Oldtown, instead he’ll make Gilly work in the kitchens like a slave. Later, Sam goes to say goodbye to Gilly. But then, he changes his mind and decides to take Gilly and Little Sam with him to Oldtown, even though women aren’t allowed at the Citadel there. Sam steals the traditional Tarly Valyrian steel sword, Heartsbane, to take with him. We’ve recently learned that Valyrian steel kills White Walkers, so it’s good that Sam can take it with him – just in case he meets more icy foes when he goes back to the Wall, or when the White Walkers make their way down further South. Back in Braavos, we get another chapter of the dramedy retelling of Game of Thrones, starring Essie Davis and Richard E Grant. This time, we’re up to the equivalent of season four, where Joffrey and Margaery get married and Joffrey gets poisoned. 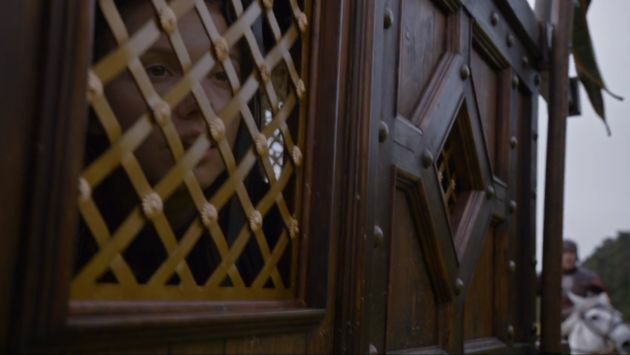 Arya watches as her target for assassination, Lady Crane (Essie Davis) kills it with her acting as Cersei Lannister. 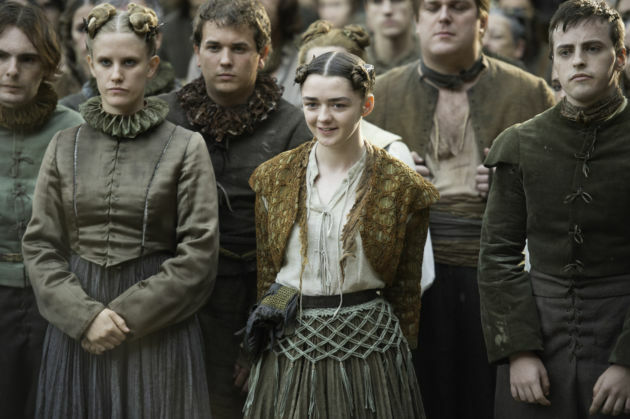 Arya spots the actress plotting Lady Crane’s murder mouthing her lines of the play, a clear indication that she’s getting ready to replace her as top actress in the troupe. Arya goes to poison Lady Crane’s drink of fine rum. When the actors go backstage to relax after a hard days’ work of parodying an Emmy-award winning dramatic fantasy series, Arya accidentally meets with Lady Crane who recognises her as a member of the audience. She and Arya have a chat, and afterwards, when Lady Crane goes to drink her rum, Arya stops her and warns her of the younger actress wishing her dead. Unfortunately, the Waif from the House of Black and White witnesses this, and goes to tell Jaqen H’ghar. Jaqen allows the Waif to kill Arya; they’ve given her too many chances and she knows too much about what goes on behind closed doors. 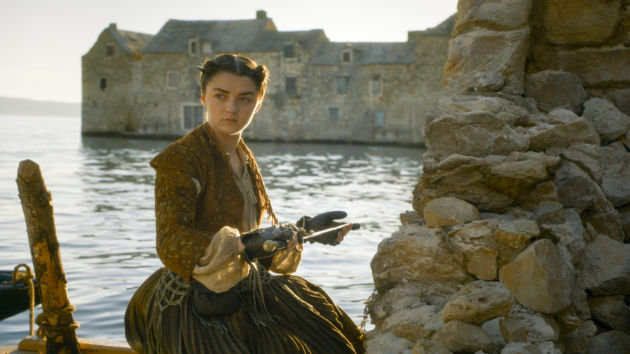 Meanwhile, Arya goes to retrieve her little sword – Needle – from inside the crumbling wall where she hid it in season four. Does this mean that Arya no longer wishes to become a Faceless Man ninja assassin and wishes to resume the identity of Arya Stark? Arya goes to hide and sleep in what looks like a dark and hidden place. But we don’t know what kinds of powers these people have, and perhaps she’ll get found out next episode. In King’s Landing, preparing for Margaery’s walk of atonement, Jaime Lannister and Mace Tyrell are readying the Tyrell army to confront the High Sparrow and his army of Faith Militant. 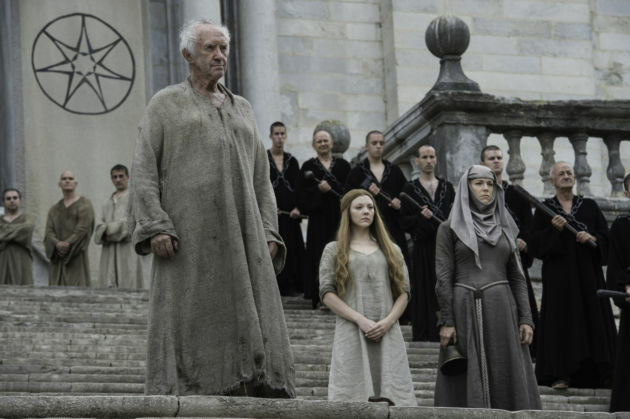 The High Sparrow is preparing a crowd at the Great Sept of Baelor, for Margaery to make her walk of atonement. The Tyrell army approach the High Sparrow with Jaime and fierce Lady Olenna Tyrell (Diana Rigg – absolutely love her). 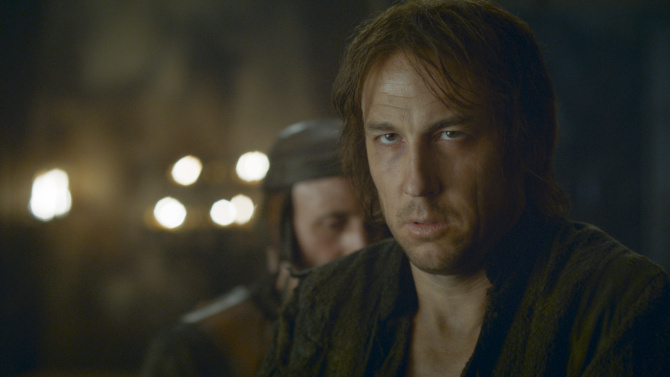 The High Sparrow says it’s not up to men to judge Margaery and get her back, but it’s for the gods to decide. However, the High Sparrow also says that Margaery doesn’t have to do the walk of atonement, so everyone who showed up to see her naked looks really disappointed. 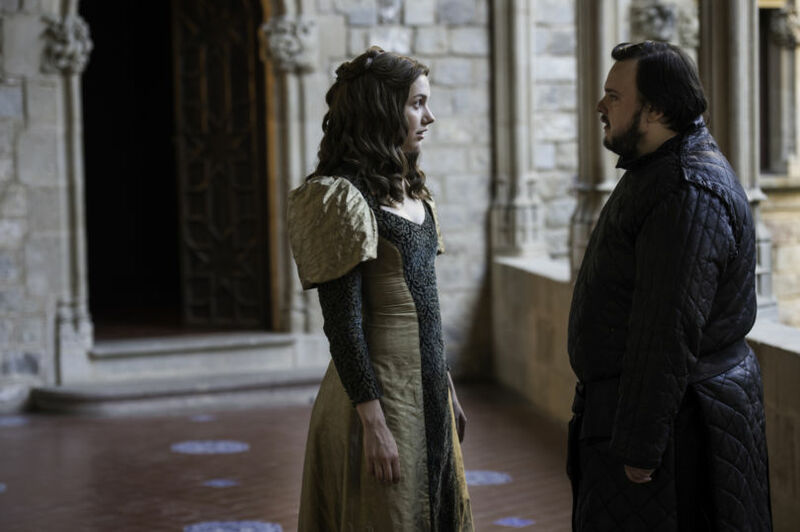 The High Sparrow says that Margaery has already atoned for her sins by bringing someone else to the true light of the Seven – it’s Tommen, and his army of goldcloak soldiers all have a different kind of sigil, merging a crown with a seven-pointed star. This reminds me of when Stannis Baratheon changed his Baratheon sigil to reflect his belief in Melisandre and the Lord of Light, and look how great that one turned out. Tommen and the High Sparrow have made a holy alliance between the crown and the faith, and Tommen says that together they will restore the Seven Kingdoms to glory. Olenna knows they’re beaten and Mace Tyrell look confused, Jaime is upset, but the High Sparrow looks very pleased with himself indeed. This was a bit of a letdown. I was hoping to see Jaime and the Tyrell army wreak vengeance upon the Faith Militant. One can only hope that the show is preparing for something extra special for the High Sparrow and his fanatical friends. In the Throne Room of the Red Keep, Tommen makes the decision to kick Jaime out of his position as Lord Commander of the Kingsguard. Jaime tries to prevent Tommen from doing so, but Tommen has made his mind up. Tommen says that Jaime has served faithfully, and will continue to do so, just not in King’s Landing. It’s nice to know that Tommen isn’t having Jaime executed, at least. Back in King’s Landing, it is revealed through conversations between Jaime and Cersei, that Jaime has been tasked with helping the Freys to retake the castle at Riverrun. Jaime doesn’t want to do what Tommen has instructed him to do, as he just wants revenge against the High Sparrow for his insolence. 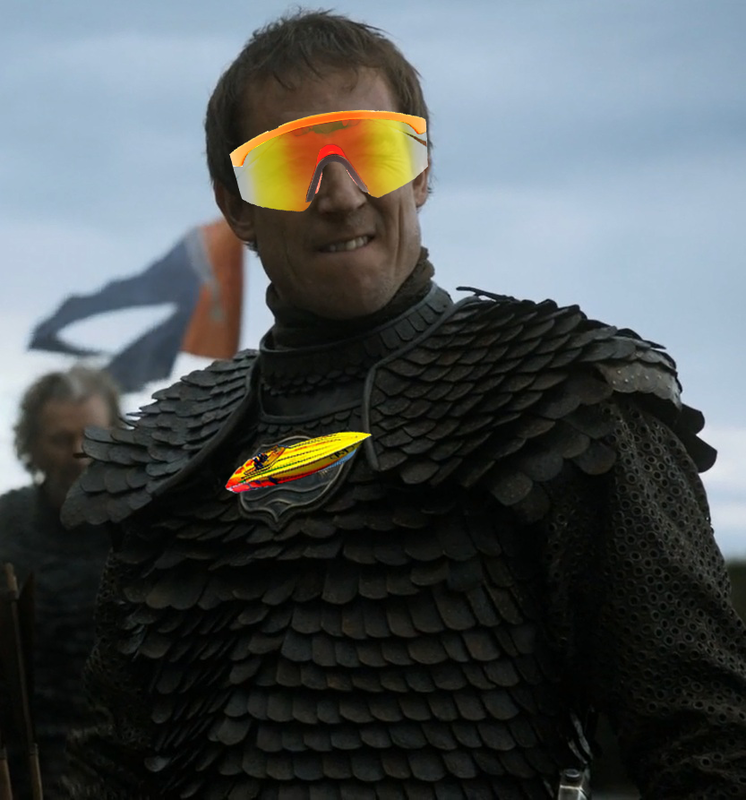 He wants his sellsword pal Bronn of the Blackwater to do the mission for him. Cersei appears to be more measured in her decision making in this scene, which is a change. She encourages Jaime to do what Tommen tells him to do; to show everyone what Lannisters are, what they do to their enemies, how strong they are. Jaime is worried about being away from the city during Cersei’s trial, but Cersei assures him that it’ll be a trial by combat, and it’s all good because she has the Franken-Mountain. Jaime and Cersei hook up again, which is nice for them, but this is one change from the books that I won’t abide by. Did you guys remember that in the other episode, Sansa tasked Brienne with heading to Riverrun to meet with her uncle the Blackfish? This means that Jaime and Brienne might be in the same place at the same time! I absolutely loved their roadtrips together in both the show and the books, so I hope we get to see more of their dynamic on screen. Back up North, Meera, Bran, and a mysterious hooded figure are beside a campfire. The hooded figure reveals that the Three Eyed Raven sent for him before his death, that’s why he’s helping them. He also reveals that he knows a little bit more about Bran Stark than he should. 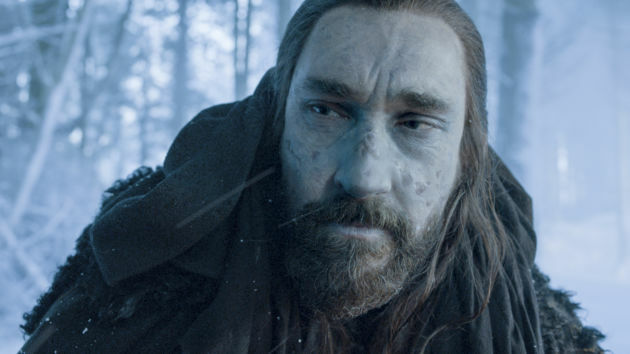 He removes his hood to reveal that he is Benjen Stark, Bran’s uncle – a character we haven’t seen since season one, a ranger from the Night’s Watch who went off on a mission and never came back. He doesn’t look too good – he looks like he’s half White Walker and half human, which is basically what he says as he describes being stabbed with a White Walker’s ice sword and being revived by the Children of the Forest. This aligns with a fan theory from the books, as Benjen Stark appears to be representing a character named Coldhands, and I’m super excited about it (even though George R. R. Martin said that Benjen is definitely not Coldhands in the books). Bran says that he’s having trouble with his visions, but Benjen assures Bran that when the Night’s King reaches the world of men, he and Bran will be ready to fight him. 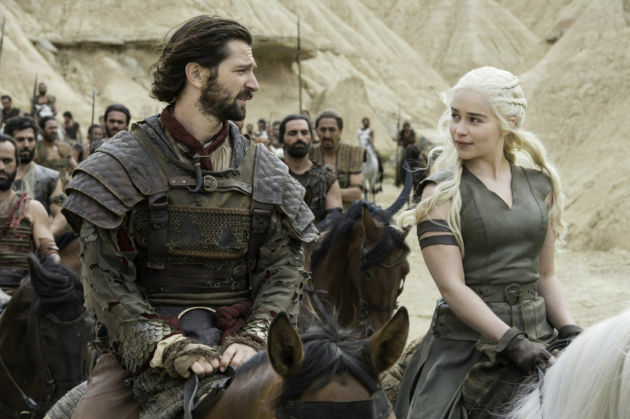 Out East, and in the final scene of the episode, Daenerys Targaryen discusses her current state of affairs with Daario as she and her Dothraki khalasar head to Meereen. 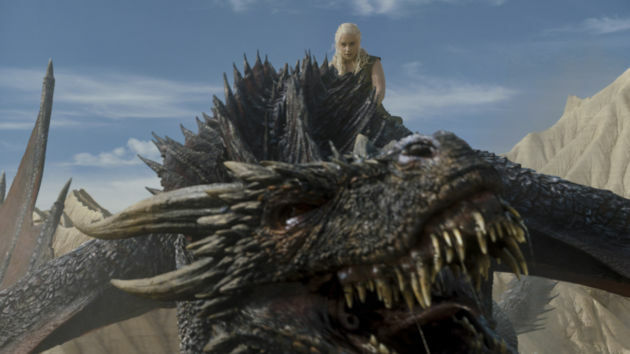 It’s a week’s ride to Meereen, and then they intend to grab their army, get some ships, sail for Westeros, and then Daenerys can take what is hers. But Daario thinks Daenerys suits the role of a conqueror much better than the role of a Westerosi queen, and perhaps wants her to stay in the East with him. Daenerys notices a shadow and goes off to find her dragon, Drogon. She rides him over her khalasar, winning their affection once again, screaming a rousing speech and rallying the Dothraki to come with her across the seas to Westeros and to claim the Iron Throne. This was indeed a rousing speech and very motivational, and it reassured viewers that it is Daenerys’ intention to continue on to Westeros to claim the Iron Throne as hers, which she’s intended to do since season one. But this final speech felt very much capped-on; an intentional manner of ending the episode on a high moment, as opposed to the natural horror of the ending of last episode. Daenerys’ big episode ending a couple of episodes ago was way better, and this one just felt a bit repetitious. This was a good episode, but it wasn’t a great episode. It felt a little bit choppy and out of balance. I feel like any episode after last week’s was probably always going to be a bit disappointing for some people, simply because the last episode was so good. But here we are, just over half way, and things are still being set up – and we’re still watching silly moments like Sam and Gilly’s rom-com dinner party. I feel quite positive that the rest of the episodes are going to be reveal after reveal, judging by the time that the show is putting into setting up plot elements. But I could be wrong. The trailer for next episode, entitled “The Broken Man”, makes it look like next episode will be a doozy. 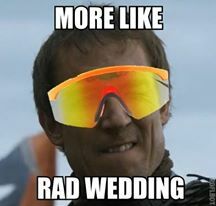 We’ll get to see Jaime and Blackfish Tully at Riverrun, Tyrell and Lannister drama, Sansa defending her actions, Yara and Theon in Volantis, Jon and the wildlings, my favourite Edmure being threatened with a knife, and Ser Davos Seaworth making a very salient point about the dead marching on the Wall. I hope Arya’s storyline will move forwards a little bit as she seems to have officially decided to not become a Faceless Man. I hope she goes back to Westeros and starts picking off the people on her list! I have always thought Coldhands was Benjen Stark. Me too! I was super excited to see this happen on the show, even if Benjen isn’t Coldhands in the book (or so GRRM says). A total disaster! I wish D&D would see some sense about this one.